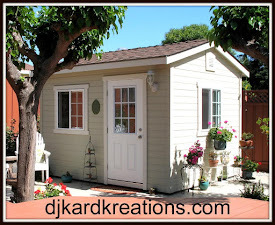 djkardkreations: NBUS Challenge #6 ~ Day Seven! NBUS Challenge #6 ~ Day Seven! Aah, there's nothing like the fresh clean scent of a new Monday! What adventures await you this week? 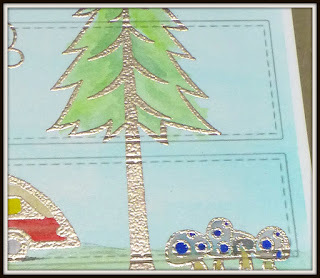 I've only got one card to share today and it involves the adventure of camping! This adorable NBUS stamp set is by Bo Bunny called "Roughin It." 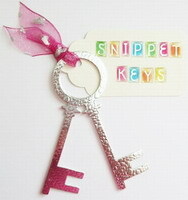 One of my dear bloggie friends sent it to me a long time ago and it is finally getting some love. And it's platinum love, no less, all colored in with water paints. The toadstools and the little car are from Paper Smooches and the sediment is from the "Fillable Frames #8" set by Papertrey Ink. This card was inspired by my friend Kim. 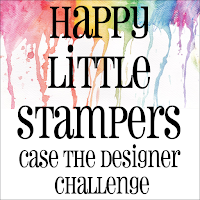 She is the featured member of the Design Team this month for the "Case the Designer Series" at Happy Little Stampers. She made an adorable scenic back-to-school block card. The NBUS die I used for the stitched panels is Die-namics from My Favorite Things called "Strip Dies-Horizontal Panel." 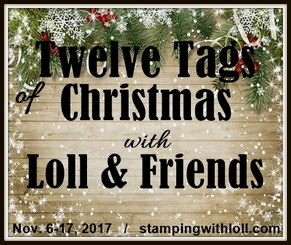 I'm also entering the Simon Says Stamp Wednesday Challenge where the theme is "Touchy Feely" and the featured manufacturer is My Favorite Things. We camped for many years, three decades plus, camping out of the car, sleeping in sleeping bags on top of picnic tables, then out of the back of the pickup. Next we upgraded to tents, then Volkswagon Vanagons, and then a pop-up tent trailer. Now the only camping we do includes room service, but the camping memories I treasure most are from the times when we were poorest. Funny how life works that way. The fun we had and the majestic vistas we saw were well worth those nights when the tent and everything in it were drenched with rain, and those dusky evenings trying to put up a tent (legally) in a city park while my poor Mister was sneezing his head off from hay fever. We made him a sun screen out of one of his diapers and called him "Dan of Arabia!" Isn't that a fantastic photo? Just look at that drool all over the rim from his teething! Goodness, it makes me laugh out loud every time! We bought that Gerry baby backpack secondhand, so I have no idea when it was first made and I've only just noticed those pink gingham curtains I made for the truck shell so we could block out the early sunrises and have some privacy. Here's that same boy all these years later with that same winning smile. Somehow he grew up to be a well-respected top-notch lawyer and we think he is still just as cute and sweet as ever. And now he enjoys camping with his own twin boys! Oh, wait, no, that's prolly not the description he wants to present to opposing counsel, so I take that back. He's not the least bit sweet. I meant to say he's tough, he's very, very tough! Hahaa, I really like reading your posts,laughing at the "not sweet but tough part" Your card is perfect for the HLS, I cannot think of anything for it as of now. Always a pleasure to stop bu here. A great card and reminded me of our camping memories too. Happy Days, but we prefer a bit more luxury now our bones are a lot older! Love the two photos of your son. To think that little cutie grew up into that handsome young man. I love your camping car Darnell. I know a few camping fans who'd love a card like that. Dan was indeed a beautiful baby and now he is an extremely handsome young man, I can feel your pride as you write about him .... if I ever need a lawyer... just saying! I love your card, it evokes memories of camping for me too, but my foray into camping was not good as your experiences, so it only happened once....in the Girl Guides.. did someone say stay clear of the Poison Ivy... oops!! Ooo-errr, totally agree Darnell, utterly cutesy your little guy, we camped too, for five to six weeks every summer for 21 years, only ever in tent though, pretty comfy in the old style, not the modern sort. They were much roomier and yes open to the air, loved sticking my head out under the bottom of the tent to look up at the stars at night. Those were the days, son is very handsome indeed understand your pride in him. Great card, have admired that stamp set enforce somewhere, you're doing incredibly well posting so regularly, dear friend. What a super card and lovely memories for you ... You have a very handsome son and it's easy to see who his Mama is ... he is so like you! Great use of your NBUS, Darnell. Adore the card! And the memories you shared. My experiences camping include backpacking in the Sierras with my dad, best friend and some Boy Scouts. Ohhhh, some days were hard, but in the end loads of fun. And the waterfalls...those were my favorites. Thanks for sharing your adorable albeit tough son! :) Have a great week! 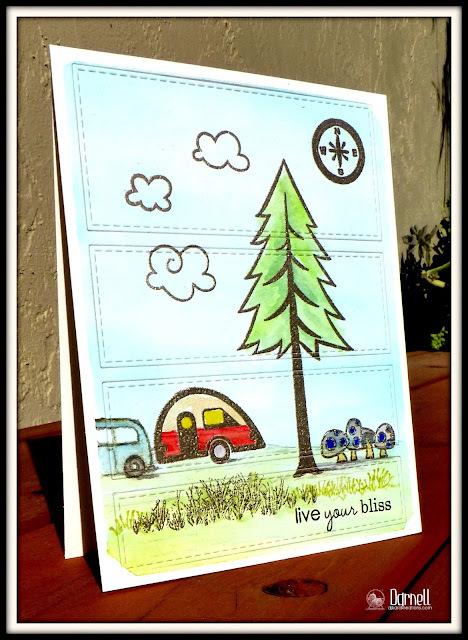 Adorable card and loving the camping story! Thanks for sharing that adorable photo of "Dan of Arabia". It makes me smile! Such a wonderful card, Darnell! Love it! And what great memories...oh, how I can relate. ;) Love the pics! So glad I popped by this morning to enjoy your post! Always good to start the day with a smile, and you gave me one! Posting an entry soon, and just enjoying the other beauties in the lineup! So glad my NBUS PTI order came! Blessings dear Darnell! You are adorable, Darnell! My first time visiting here. I love your blog! Love what you do! Your card is sweet and wonderful, better yet because it brings back memories! We too are campers, however we've traded our mini van filled with "kid stuff" to motorcycle saddlebags filled with necessities! Love the photo! Love the photos of drooling Dan of Arabia AND the adult version of "tough, very tough" Dan :-) Great save, Mom!! We had some wonderful camping trips too! The last one was tent, I I heard a creature outside making num num, num and thought, I don't want to get eaten lol. So now, its hotels :-) Wonderful card, and your son looks like a sweetie.....oops I mean tough! Such a darling card...reminiscent of camping, you do come up with the best themes. I saw Kim's card, as well, and after steadying myself in the chair, tried to come up with something that would do it justice. No luck. But you did it so well. Love the platinum embossing with that lovely soft looking watercolor. What a wonderful camping story & picture, Darnell! By the time we got married we were both past tents, but we started in the back of a van trying to stay dry cooking under the raised back door & after we added a puppy to the family we moved to trailers/motor homes starting very little. Now we have a nice trailer that makes it comfortable for the 3 of us & I do love enjoying the beautiful scenery in comfort! Oh what a terrific card--wonderfully crafted scene, my friend! Your tough guy is adorable , you must be so proud! Beautiful card and I can’t believe its day seven already. Life is busy for sure! That is a really great and fun card showing camper fun! I wish I could share your enthusiasm about Mondays. Life coaches say it's all about the attitude. But I stick to Garfield's opinion when it comes to this day of week. Cute baby turned into handsome man. Great card. I like how the scene is cut into sections, great detail! 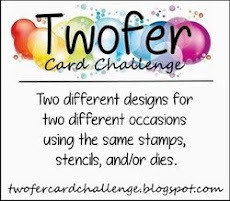 Super fun card and stamp set!! Another fun post to read...oh yes, I can remember some great camping days with my kids myself...I miss those days!! What a fun camping card Darnell! Great design stamping over the cover plate die cut - we always camped growing up - and we did it for a while after marriage and baby - but give me the hotel now with the soft bed! 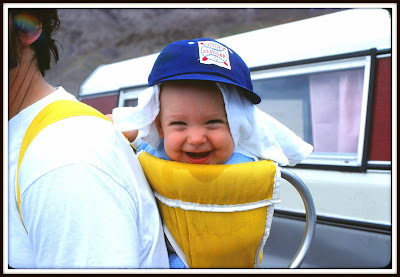 That is a wonderful photo of you son on his first camping trip - cracked me right up - could anyone look more happy??!! Darnell, I love your posts, every single one of them makes me smile and this is no exception. I adore your little Dan of Arabia and look at him now, not much younger than me, and all growed up for proud Momma. I love your card and your story. I agree, somehow our poorest times are the most happily remembered! Will he read your blog though? You could be in trouble, he might sue! We used to go camping too, and we have just had some of our old slides made into digi photos so the memories are flooding back! I only just woke up and smelt the paper, and found out this was on! So I will try and enter, better find out what is going on first! Well I can see he has your good look Darnell, oh and a tad of the Mister as well, don't want to get in his bad books. Great card once again, totally love the design, brilliant. Had a right old giggle today. Your handsome son must lurvee his yummy mummy for showing the head nappy photo. Ha ha. Another brilliant card again today. Your stamp is fabulous. Oh my gosh, I am loving this post and that photo of your cute little canyon trekker! How great that you provide the comparison, and proof that he made it out alive, ha! My parents used to take all 4 of us camping at the beach way back when there weren't even any bathrooms, or even running water there (and my youngest sister was still in diapers...cloth ones at that). Those heavy old canvas tents and wooden tentpoles are something I still remember. We owned a business during our own kid's childhoods so didn't get away much at all but managed to do some backyard camping, which was much much easier. Those stitched panel dies give just the perfect bit of texture to your scene and make me think of an embroidered piece mounted on a cabin wall! You must be careful, I enjoyed your story so much I almost forgot to comment on your fabulous card! Camping memories are wonderful memories and I could not agree more. The fun times and memories from we were the poorest! I want to get my albums out and look and camping photos again. Oh the card--delightful! What a cute and dear card, Darnell! I love camping too, still do it almost every year... it is so peaceful and magnificent to lie down looking at a starry night, makes me feel so small and yet so quiet. This is an adorable card!! I love at the inking. I love your story!! Such fabulous memories. I ABHOR camping and so glad that I married a man that feels the same. I will take a hotel room any day!! Simply fabulous card Darnell and I love your post today. I had to chuckle at you camping stories, so sweet. My camping has always included a place where I can call for room service...see you soon. What a cute little camping scene!! But your tiny Dan of Arabia steals the show here today!! 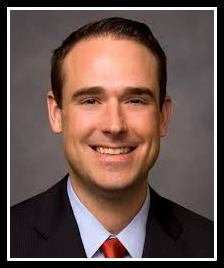 With a smile like that of course he is one tough lawyer, Darnell, and he would make all the opposition women swoon too! Double edged sword :-). What a handsome son you have - then and now! Fun card today, too. We have a tiny RV that we go camping in. We love it and spend weeks at a time traveling in it, even though it is very, very small. Beatiful card! And some great memories you shared with us! Your son is still cute, sorry tough! Lol all this reminds me of my childhood when my parents were going camping with me in the back of my dad. Mine was blue though and it was 1973! Lots of good memories! Thank you for sharing! The pics are wonderful...thanks so much for sharing. So glad to have caught this post. I CANNOT believe you slept in a sleeping bag on a park picnic table. The bugs! The creatures! The racoon poop dropping into your face from the tree limbs above you! You are one tough cookie. And what a looker that little one of yours is ;) Oh yeah, there was a card here too wasn't there? I did not give that design of Kim's a go but it sure is a great one. Love your interpretation. Those were different days. I remember camping out in college at Parker Dam in AZ. My idea of camping now is a hotel without room service. Your card sparked wonderful memories of more innocent times. thank you for that dear Darnell. What a great card Darnell and such a great CASE of Kim's card. Dan of Arabia is utterly gorgeous and your reminiscences brought back some memories for me too. Camping in a two man tent in the pouring rain and trying to cook on a tiny primus stove while the wind howled comes to mind first, but later trips to camp in France with the children where the tent had been set up for us with many mod cons, was more my style.You might think that the ready availability of wine and fresh croissants had something to do with this, but I couldn't possibly comment! I bet your blog is making the rounds at the law firm. lol! 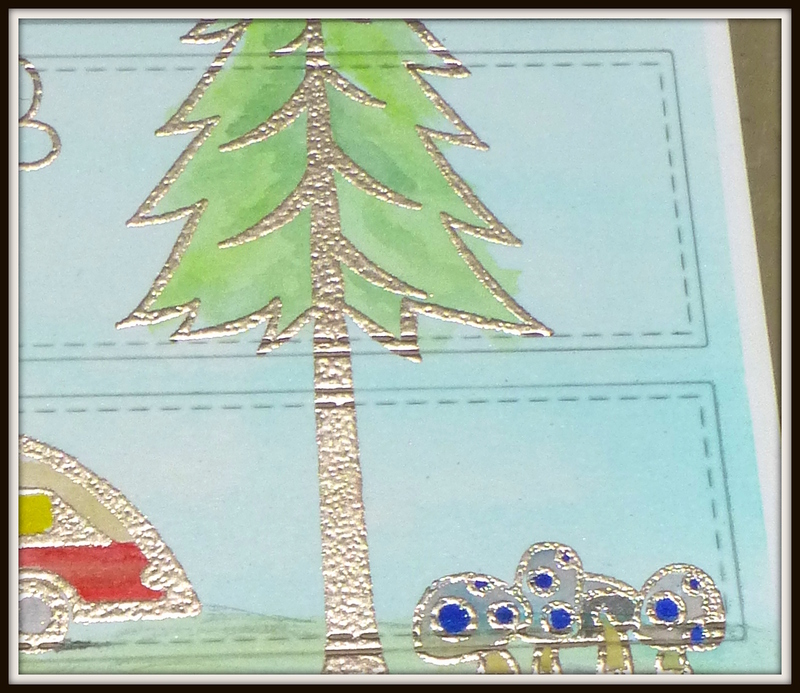 I have fond memories of camping, too, and love your shiny card!